kc bob: Are you laboring today? I have often thought that the day reflects a bit of an oxymoron - most people do not labor (for their employers anyway) today but spend the day sharing good food and great conversation with friends and family. Even so, I think that this image of "labor" speaks loudly. I am not laboring today but headed west about 45 miles to have lunch with Ann's wonderful 96 year old mom. 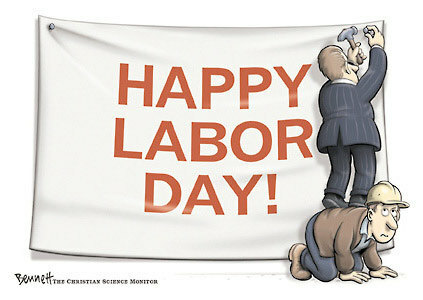 Will you be celebrating the day with labor or something else? We're just hanging out here at home. Irene and I are enjoying a wonderful day at home.